Take it easy with Cheesy Rice and Beans. This hearty one-dish meal has rice and beans, of course, but also has turkey, tomatoes and melty cheese. Cook and stir turkey in large nonstick skillet on medium heat until no longer pink; drain. Add tomatoes with their liquid, the beans, rice and water; mix well. Cover. Cook until liquid is absorbed, stirring occasionally. Top with Singles; cover. Let stand until Singles are melted. 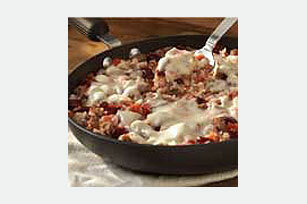 For an Italian flair, prepare as directed using Italian-style diced tomatoes. Plan ahead! Set aside time to plan a week of meals so you have ingredients on hand and are less tempted to dine out. This allows you to include some of your favorite recipes like this one!